Scientific inquiry involves students progressively developing key scientific ideas through learning how to investigate. Students build their knowledge and understanding of the world around them through the process of inquiry. Although sometimes described as discovery based learning, this doesn’t need to be the case. The article below by Kirschner et al., (2006) is a good summary of the problems associated with an unguided, inquiry approach. That said, that are some strong, motivational reasons why you might like to do some inquiry with your students. Just think about what knowledge the students will need to know first, in order to inquire in a meaningful way. During an inquiry, students use skills employed by scientists such as raising questions, collecting data, reasoning and reviewing evidence in the light of what is already known, drawing conclusions and discussing results (based on IAP 2011). The graphic on the right, stolen from Wynne Harlen, shows how inquiry can lead to development of understanding. Much of the difficulty in determining whether inquiry works is that we don’t have a shared understanding of what inquiry is (Minner et al., 2010). 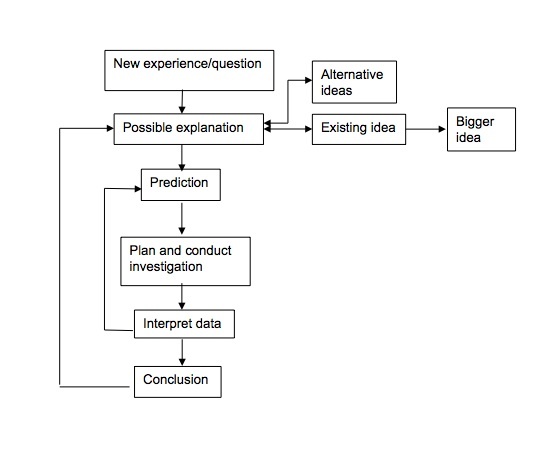 The AKSIS Project (ASE-King’s College London Science Investigations in Schools) describes five additional investigative approaches to the fair testing model described above: fair testing, classifying/identifying, pattern seeking, exploring, investigating models and making things (Watson et al., 1999). Taken from the 2013 Ofsted report into effective science provision in primary and secondary schools. Provides opportunities for students to apply their knowledge and discuss ideas together. Try to get students to chose questions to investigate that will produce a result that can be explained using age-appropriate scientific knowledge. For example, students can spend time investigating why different coloured sweets take different amounts of time to react with HCl. However, unless there is an appropriate conclusion to be drawn then the impact of the inquiry is limited. Avoid open-ended inquiry where students can end up explaining phenomena using wrong science. Use equipment that is simple and safe to use so that students have autonomy, control and are able to make mistakes – this is more motivating. Brown, CR., Moor J., Silkstone, B.E., and Botton, C. (1996). The construct validity and context dependency of teacher assessment of practical skills in some pre-university level science examinations, Assessment in Education, 3 (3) 377-391. Harlen,W. Learning science through inquiry. From education Scotland. Kirschner, P. A., Sweller, J., & Clark, R. E. (2006). Why minimal guidance during instruction does not work: An analysis of the failure of constructivist, discovery, problem-based, experiential, and inquiry-based teaching. Educational psychologist, 41(2), 75-86.75-86. Watson, R., Goldsworthy, A. and Wood-Robinson, V., 1999. What is not fair with investigations?School Science Review, 80(292), pp.101-106.